Another day in the law courts, another adjournment. ECOWAS Court sitting in Abuja this morning adjourned to 30th May 2018 the matter of Nnamdi Kanu vs FGN pending before it for nearly 2 years. The reason for this yet another adjournment is because ECOWAS Court staff have not finished translating documents submitted in November 2017. 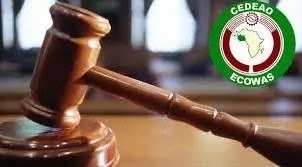 IPOB lawyer Ifeanyi Ejiofor informed the court that he would be withdrawing the matter from ECOWAS COURT since the court has been bought over by the Nigerian government. He alleged manifest bias in the conduct of the court. IPOB cases are too hot for corrupt African judges to hear. Judiciary in Africa is a joke. Even ECOWAS is as corrupt as the Appeal Court in Nigeria. Can't imagine my husband back to me. Thanks to Dr.bante for bringing him back to me. After everything I had to go through , dr.bante I owe you everything. Thanks a lot . If you need your ex husband /wife back . Please kindly contact the priest on [email protected] or WhatsApp him on +2347059073543. Hello everyone am here to share my testimony. I was suffering from BREAST CANCER for the past 3 years and my Dr told me that there is nothing he could do, after the 5 times chemotherapy and radiation and i was not responding to treatment and not even getting better and i had no money for Surgery because it was too expensive for me. I was frustrated and confused, seeking advice from people until a friend told me about Dr.farouk Herbal Medicine and herbal cannabis oil and its fast curing ability of any kind of cancer and told me that her mother's LUNGS CANCER was cured by the same Doctor farouk. I was desperate to to have the HERBS and i contacted Dr. farouk via email to get the miraculous oil. The Dr send me the Herbal Medicine and Cannabis oil through FedEx, to cut the long story short, i got Completely Cured after taking the Herbs for a week. To cut the long story short, as i am writing this testimony on this Blog am so strong and healthy no more cancer in my body again. I did my test and the Doctor confirmed it, i do not have BREAST CANCER anymore which he (The Medical Doctor) was Shock when he confirmed it. I really want to Appreciate Dr.farouk who got me cured with the help of his herbal medicine and to God Be All The Glory.